Tue 16th April 2019 Speaker Jess Ridgers: “Creating independence through design." Tue 26th March 2019 Speaker Documentary film maker Frank Bond will show his film, “Strong to Save”. Tue 25th December 2018 No meeting. Tue 18th December 2018 Club Council @ 18:30, and Special General meeting. The Great Elf Christmas Game. Tue 30th October 2018 Video Quiz on British Humour. Tue 9th October 2018 Talk on Sand Dams by PDG Jim Onions of district 1145. Tue 25th September 2018 Artefacts Evening. Tue 18th September 2018 How to view our club website. Bill Lane - "I did it before Joanna." Two years ago Joanna Lumley made a television documentary of a trip she did by train through China and across Siberia. This talk is of the same trip done in 1965. 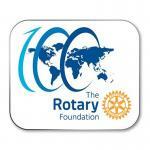 Talk by Tony Quinn on Rotary Foundation: "Doing good in the world". Talk by Rob Porter "Farming in the 50's and 60's".